PUNE, India (Reuters) - Ganesh Bhalerao is a cartoonist hoping to go viral in the battle to secure Prime Minister Narendra Modi's re-election when India votes over the next two months. 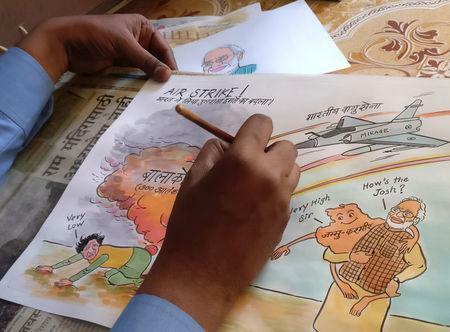 "Political parties are realizing the importance of cartoons as they elicit a huge response," the 29-year-old former art teacher told Reuters while feverishly sketching a piece glorifying the Modi government for ordering India's recent air strikes against Pakistan. "A cartoon conveys the message of a 500-1,000 word article in just a minute," he said. Like the BJP, Gandhi's Congress Party and other rivals have their own armies of artists, video editors and journalists to create online content for the social media war. Social media has made it a lot easier for political parties to get out their message to more voters. But nowadays, India's masses want politics served with more pizzazz. "The larger audience is now more inclined to short videos, cartoons and visuals," Dimptangshu Chowdhury told Reuters in Kolkata, where he heads the IT wing of Trinamool Congress, a powerful regional party in West Bengal. India is by far the world's biggest democracy, but most of its 1.3 billion population belong to lower income groups. And, at a time when more mature democracies than India's are grappling with the impact of social media, there are concerns about the electorate's susceptibility to false messages spread online. When Modi's BJP won a landslide victory in 2014, social media had not become as pervasive as it is today. Data plans were expensive and pricey smartphones were unaffordable for far more people. India's Election Commission has asked candidates to report their spending on social media and it also requires them to seek approval for advertisements, but such rules can be bypassed by the use of proxies. Putting a cut-off on campaigning doesn't have any effect anymore, as the Commission is unable to control what is posted online, according to Nikhil Pahwa, digital rights activist and editor of MediaNama, a Delhi-based publication. "It just doesn't know how to deal with the idea of content being available online in perpetuity," Pahwa said.